West Ham United are recruiting a Director of Football, Huddersfield Town are recruiting a Head of Football Operations and Bury Football Club are recruiting a Sporting Director. This relatively new position(s) is very much in the minds of leaders in football, as Clubs are seeking to find a competitive edge. The Sporting Director role (or whatever alias Clubs use) is viewed as one way of doing so by providing a strategy and culture set for high performance on and off the pitch. 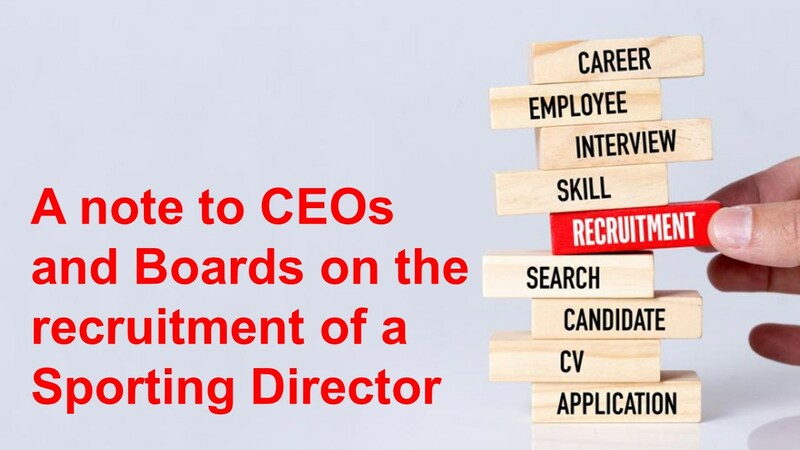 The adoption of the new role will be welcomed by many in football, yet the lack of clarity in the recruitment process and transparency related to the recruitment of a Sporting Director by CEOs and Boards, including their roles and responsibilities raises concerns related to the success of these recruits. Our recent research based on interviews with 10 Sporting Directors (or equivalent) in English professional football highlighted that the title of the position, whether Sporting Director, Director of Football, Technical Director or Head of Football Operations, did not matter to our football leaders. For them, it was the role and responsibilities which were most important (Parnell et al. 2018 forthcoming). One major concern in the recruitment of Sporting Director is that clubs recruit based on recommendations alone, or someone who has only been a chief scout, with perhaps limited experience. Often overlooking a highly able and credible talent pool, looking to break into a very closed environment. However candidates are recruited, the roles and responsibilities for these positions are not typically shared during the recruitment process and in many cases, not even once someone is appointed. This is a problem as it can create tension internally across departments and externally between the Club, fans and the media. For example, someone may have a Director of Football title, but does not control the entire recruitment decisions. Despite this, the media and fans will place full responsibility on their shoulders for the recruitment of players, which can create a range of issues for the Director of Football and Club. One step in the right direction is to ensure that the right person is recruited for the job and that recruitment is clear communicated within the Club and with fans and the media. In this regard, Boards and CEOs could be criticized for the lack of transparency in their recruitment of a Sporting Director, which may contribute to the lack of understanding and communication within clubs and with fans and the media. In a bid to support CEOs and Boards I have developed a generic preliminary job description / specification to share freely. Please note: this is by no means final or set in stone and I am sure some will say this argue this role is too much for one person, so remember its just a generic guide on the recruitment of a Sporting Director! Furthermore, we all know each club is unique in its ownership and organisational structure so will have its own ways, but I hope it serves to generate discussion and debate across decision makers for more effective recruitment, greater clarity and clearer communication surrounding football leadership appointments. Reference: Parnell, D., Groom, R., Widdop, P., and Ward, S. (2018). The Sporting Director: Exploring Current Practice and Challenges within Elite Football. In: The Routledge Handbook on the Business of Football, edited by Simon Chadwick, Daniel Parnell, Paul Widdop, and Christos Anagnostopoulos. There are a number of iterations for the Sporting Director and elements of the role that some clubs chose to focus on depending on their operating context, such as Director of Football, Head of Football Operations or Sporting Director. Whatever this may be, we like other clubs are making a decision to develop a stronger football strategy across the football side of the business. The Sporting Director is the person responsible for the overall performance of the various sporting departments, which include first team, Under-21s, academy, scouting, medical and sport science. This responsibility ties hand-in-hand with the Sporting Director’s role, which is to develop and deliver the strategic plan towards achieving success in the club’s sporting aims. The Sporting Director should report directly to the Owner and/or Chief Executive Officer / Board – or sit on the Board. The Sporting Director should be responsible for the strategy of the football club from the first team, through the U21, academy, scouting and recruitment, medical and sport science – and in some cases extended to in some cases the community foundations of football clubs who can play a part in recruitment and talent identification. Given the scope of the role, it is important to maintain clear communication with internal and external stakeholders. This ensures that the Sporting Director is not solely measured on 1st Team performance or recruitment, which may neglect significant success in other areas notably financial sustainability through effective business away from the business, for example the loan system. Reporting directly to The Chief Executive Officer / Board / Owner, you will responsible for the performance of the clubs football departments. This will include 1st team, U23s, player movement in and out of the club, loans, academy, performance and sport science, medical services, performance analysis and the training ground. Where relevant this will extend to the Community Foundation / Charitable Trust. There is a responsibility for employing and managing the four main department heads (1st Team Head and Head Coach, Head of Recruitment and Scouting Network, Academy Manager, Head of Performance, Head of Medical Services, Head of Performance Analysis). This includes the annual review process for all senior positions, due diligence and transition planning for non-playing and playing staff. We are looking for a leader who can pull together all of the various aspects of the Football Clubs football operation to help create a powerful and lasting asset that is developed consistently over time and which stands solidly and independently of the current 1st Team Manager. Our Director of Football will provide the leadership to develop, implement and evaluate a strategy for football and financial success. Good mediation skills when balancing tensions between staff / players / the Board. Other places – as required in order to complete the job. Normal hours of work 9.00am – 5.00pm Monday to Friday. Due to the nature of the football industry you will be required to work outside normal hours of work including weekends and bank holidays and stay overnight on recruitment and 1st team duties. Be part of the recruitment and employment process of the 1st Team Manager and Head Coach and ensure that they perform all the duties set out in their contract to the best of their abilities. Ensure that the 1st team players adhere to their codes of conducts and contractual obligations. Ensure that the contractual situation to each player is relevant to his age, ability and future value and keep the Club informed of suggested sales and new contracts. Set targets for the 1st Team Manager and Head Coach and 1st team staff, plus oversee the contracts and recruitment of all senior coaching and supplementary staff. Liaise with The Chief Executive Office and Facilities Manager that the stadium and training ground has suitable facilities to enable the coaching, recruitment performance and sport science, medical, performance analysis, academy and playing staff to effectively perform their jobs. Ensure that the professional players have adequate pre-season/mid-season preparation plus oversee the games programme (loans etc) for all professional players. Employ, recruit and manage the Clubs Head of Recruitment and Scouting Network and oversee the recruitment programme from senior down to academy level. Ensure that, along with the Head of Recruitment and Scouting, the Club has enough satisfactory options to enable the Club to achieve its targets. These targets may change and will be agreed, for example, maintain Premier League status etc. Ensure that the Club has worldwide knowledge on players, transfer targets, the value in the market on transfer fees and wages. Ensure that the club have a top class recording and database system for players and the analysis of players, this would include performance analysis of our own players from senior professionals to Academy players. Where relevant work with the Head of the Community Foundation / Charitable Trust to optimise talent identification systems. Employ, recruit and manage the Clubs Loan Manager to oversee all loans activity at the Club. Ensure that, along with the Head of Recruitment and Scouting, the Academy Manager, U23s Manager and 1st Team Manager and the Club has enough satisfactory options to enable the Club to achieve its targets. These targets may change and will be agreed, for example. Facilitate the successful management of loans in and out of the Club through strategic loan agreements. Measure the effectiveness and impact of this activity. Ensure the Loans Manager implements a holistic player performance and welfare programme for players in and out of the Club. Develop a clear strategy to enable a financial return on investment from loan activity. Ensure that the Club adhere to all recommendations and requirements to enable the club to compete in the Premier League and any other relevant competitions. Ensure that, along with the Head of Performance / Sport Science, the Club invests in appropriate facilities to enable the Club to have a top class facility and state of the art, evidence based Performance / Sport Science programme for senior and Academy players. Set targets for the Head of Performance / Sport Science to be reviewed and agreed each season. Ensure that the Clubs full time staff and part time consultants are at a required level and are appropriate in terms of numbers and costs. Ensure that the Club adhere to all medical licensing/recommendations and requirements to enable the club to compete in the Premier League and any other relevant competitions. Employ, recruit and manage the Academy Manger and help with the appointments of additional staff. Ensure that the Club has a technical programme that is relevant to 1st team players and the Clubs DNA and this programme is delivered to all Academy players by the Academy staff. This would include In-Service training sessions and courses. Set targets for the Academy Manager to be reviewed and agreed each season. In conjunction with the 1st Team Manager and Head Coach, Head of Coaching and Academy Manager, ensure that the young players have a route through, are afforded the same possibilities as transfer targets and have a suitable playing and training programme that will help them attain 1st team football. Ensure that the Academy has the support to enable it to meet Premier League criteria to meet the licensing requirements to maintain Academy status at the highest possible level. Employ, recruit and manage the Head of Medical Services (HMS). Ensure that, along with the HMS, the Club invests in appropriate facilities to enable the Club to have a top class facility and rehabilitation and prehabilitation programme for senior and Academy players. Set targets for the HMS to be reviewed and agreed each season. Ensure that, along with the Head of Performance Analysis, the Club invests in appropriate systems and facilities to enable the Club to have a top playing and recruitment performance analysis programme to meet the needs of the Club. Set targets for the Head of Performance Analysis to be reviewed and agreed each season. Liaise with the Clubs media department and be available for a reasonable number of interviews and events. Liaise across the Academy Manager, Head of Recruitment and Scouting Network and Chief Executive Office of the community foundation to support talent identification pathways. There is a requirement to attend Board and Management meetings when requested and it will be expected you produce a monthly report on all of the above departments. Liaise closely with other senior staff, in particular the Chief Executive Officer, to ensure the smooth running of the Club and the training ground. Previous In Denmark, Football Fitness is the new girl in the FA school of football – but who is she? Next Frontiers of Management History Book Series launched in conjunction with Emerald!